Lord Krishna teaches that the individual living entity, though possessed of the attributes of God, is never equal to Him. 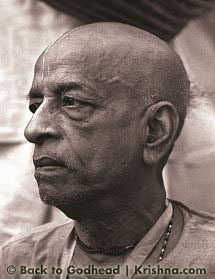 What is the objective of this Krishna consciousness movement? It is a process for purification of consciousness. In the Bhagavad-gita (2.17) Lord Krishna says, avinashi tu tad viddhi yena sarvam idam tatam: "That which pervades the entire body you should know to be indestructible." There are two kinds of consciousness. One consciousness is limited, and the other consciousness is unlimited. The unlimited consciousness is there in God, and the limited consciousness is there in you, in me, and in all living entities. If I pinch your body you feel pain. This is consciousness. "Somebody is pinching me." But if I pinch somebody else, you cannot feel it. Therefore your consciousness or my consciousness is limited to this body. Similarly there is another consciousness, which is Krishna's consciousness, or universal consciousness. If I pinch your body, Krishna as Paramatma, the Supersoul, feels that I am pinching somebody. These things are explained in the Bhagavad-gita. Krishna in the Bhagavad-gita, Chapter 13, mentions kshetra-jna. Kshetra, which means field, refers to the body, and jna means knower. So kshetra-jna means the knower of the body. Krishna says that in every body there is a kshetra-jna. I know the pains and pleasures of my body; you know the pains and pleasures of your body. "The Supreme Lord is situated in everyone's heart, O Arjuna." (Gita 18.61) Therefore He knows the pains and pleasures of all bodies. That is the difference between Krishna, or God, and us. That is the test. Somebody is claiming, "I am God." How can you be God? You cannot know the pains and pleasures of others. But Krishna knows. That is the difference between God and the living entity. God is conscious and we are conscious, but our consciousness is limited and God's consciousness is unlimited. That is the difference. Krishna told Arjuna, "I explained this yoga system to the sun-god." And Arjuna inquired, "How is that, Krishna? Both You and I were born recently. How can You say that You explained this knowledge to the sun-god long, long ago – forty million years ago?" Krishna answered, "My dear Arjuna, you are My eternal friend. You are always with Me. When I instructed the sun-god, you were also present, but you have forgotten. I do not forget." That is the difference between Krishna and Arjuna. Vedaham samatitani (Gita 7.26): Krishna knows everything. He knows whatever has happened in the past, whatever will happen in the future, and whatever is happening at present, but we do not know. First of all we should understand that this is the difference between God and the living entity. The jiva, or individual soul, is explained in the Bhagavad-gita as being part and parcel of Krishna. The example is given of a big fire and its sparks. The sparks are small, but in quality they are fire. They are not different from fire. If a spark of the fire falls on your cloth, it will immediately burn the cloth. The burning quality is there, either in the big fire or in the small fire. Therefore, qualitatively we are one with God. Another example is the drop of ocean water. The chemical composition of the drop of ocean water is the same as the chemical composition of the big mass of water. Krishna is all-powerful; we are also powerful. Krishna can create; we also can create. Krishna can create innumerable planets floating in the air; we can create a tiny airplane or Sputnik flying in the air. You see? So the creative power is there in both God and the jiva, but there is far difference between Krishna's creative power and my creative power. "The Supreme Lord has nothing to do, and no one is found to be equal to or greater than Him, for everything is done naturally and systematically by His multifarious energies." Suppose I want to paint a nice flower. I require the brush, I require the paint, I require the intelligence, I require the time, and somehow or other, in a few days or a few months, I paint a very nice flower. But Krishna's energy is so experienced that by working His energy, many millions of colorful flowers come at once. "This material nature, which is one of My energies, is working under My direction, O son of Kunti, producing all moving and nonmoving beings. Under its rule this manifestation is created and annihilated again and again." Mayadhyakshena: "Under My supervision" nature is working. Not blindly. To think nature is working independently is crude knowledge. A child sees an airplane flying in the sky, and he may think the airplane is flying automatically, by itself. No. Without the touch of the pilot, the machine cannot work. The machine may be perfect, but the pilot is required. At the present moment civilization is trying to avoid God, the brain of God. That is foolishness. Krishna says mayadhyakshena prakritih: "Nature is working under My supervision." The Krishna conscious person sees the hand of God behind nature. That vision is Krishna consciousness. "Whatever we see in this world is but an expansion of various energies of the Supreme Personality of Godhead, who is like a fire that spreads illumination for a long distance although it is situated in one place." This verse explains the manifestation of this world. The sun, an emblem of fire, is situated ninety-three million miles away, but because it is a fiery planet, its heat and light is expanded, and in that heat and light everything is being generated. We have got practical experience. In western countries where there is not sufficient heat and light, the trees and flowers do not grow so luxuriously. And when there is snowfall or no sunlight, the trees become dry and leafless. So, as the heat and light of the sun are the cause of the different leaves and flowers and fruits, similarly Krishna has got two kinds of energy, like heat and light. That heat and light is the spiritual energy and the material energy. The material energy is practically darkness; there is no light. The Vedic instruction is therefore tamasi ma jyotir gamah: "Don't keep yourself within this darkness; go to the light." Besides this material sky of our experience, there is another sky, the spiritual sky. "I worship Govinda, the primeval Lord, the Supreme Personality of Godhead, under whose control even the sun, which is considered to be the eye of the Lord, rotates within the fixed orbit of eternal time. The sun is the king of all planetary systems and has unlimited potency in heat and light." The scientists say that the sun is rotating in its orbit so carefully that if it moves toward one side the whole universe will be immediately turned into ice, and if it moves toward the other side then immediately the whole universe will be ablaze. The scientists have seen so far that the sun is moving very carefully. Neither this side, nor that side – exactly in its orbit. Who has planned this orbit? The Brahma-samhita informs us, yasya-ajnaya: "by whose order" the sun is rotating exactly in its orbit (bhramati sambhrita-kala-chakro). Lord Brahma says, "I am offering my worship to that person: govindam adi-purusham tam aham bhajami. That person is Govinda, Krishna. Lord Brahma is not struck with wonder by the arrangement of the material world – how the sun is moving, how the moon is moving, how nature is working. He knows that there is a big brain behind it all: Krishna. "I am the source of all spiritual and material worlds. Everything emanates from Me. The wise who perfectly know this engage in My devotional service and worship Me with all their hearts." Anyone who has understood Krishna rightly, in truth, is Krishna conscious. He is budha, actually in knowledge. Krishna is so great. Krishna's great power is so great. Generally people take Krishna very slightly. "Oh, Krishna danced with the gopis." They do not know what Krishna is. Therefore they go to hell by hearing Krishna's rasa-lila from unauthorized sources. We have to face so many questions sometimes: "Why did Krishna act like this?" People ask this because they are listening to professional Bhagavata readers. When these professional narrators read the Srimad-Bhagavatam in public gatherings, they immediately open to the rasa-lila chapters. Because they have no other knowledge, they cannot explain the Bhagavata. They have no brain to explain all the intricate verses in the Srimad-Bhagavatam, beginning with the first verse: janmady asya yatah. Therefore they do not know Krishna. They jump to the spiritual rasa-lila, and people misunderstand. Krishna should be understood as He is – not by fiction, not by speculation, not by so-called scholarly, foolish commentation. Try to understand Krishna as He is. That is right Krishna consciousness. Then one will be able to understand how Krishna is working, how the whole world – the material atmosphere, the material cosmic manifestation – is working. Krishna says, mayadhyakshena: "under My supervision." "One who knows the transcendental nature of My appearance and activities does not, upon leaving the body, take his birth again in this material world, but attains My eternal abode, O Arjuna." (Gita 4.9) Not the foolish man, but the intelligent man who knows Krishna actually – he immediately becomes liberated. After giving up this body, he never comes back to accept another material body. He goes back home, back to Godhead. 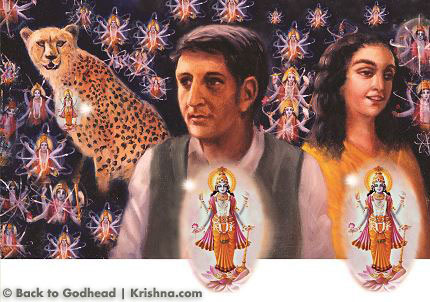 How has the living entity, part and parcel of Krishna, gotten this condition of material life? That can be explained in this way: Like the spark, as long as the jiva is in the "fire" – connected to Krishna in devotional service – it is just like fire; it is glowing, glowing. It is only a spark, but it is glowing. But if it falls from the fire, then immediately it becomes extinguished. The glowing quality becomes extinguished. There are three positions of the living entity according to the quality of the material nature with which he associates. The living entity is of one type, but when he comes into this material world he associates with three kinds of material qualities: sattva-guna, rajo-guna, and tamo-guna, or the qualities of goodness, passion, and ignorance. "Peacefulness, self-control, austerity, purity, tolerance, honesty, knowledge, wisdom, and religiousness – these are the natural qualities by which the brahmanas work." (Gita 18.42) One who has the brahminical qualities can understand his relationship with the Supreme Lord. The example of a spark is given to explain the situation of the jiva under the influence of each of the three qualities: When a spark falls on dry grass, the grass becomes blazing. If the spark falls on wet ground, the glowing quality may remain for some time, but it will be extinguished. And if the spark falls on water, it is extinguished. Similarly, when the living entity comes to this material world, if by chance he is in the association of the quality of goodness he keeps his God consciousness. If he is in the association of passion, he is materially busy. And if he associates with the quality of ignorance, he becomes an animal or an animal-like man. This Krishna consciousness movement is giving everyone the chance to glow again by association with Krishna. If you put that spark – or that extinguished charcoal – into the fire, it will again light. Similarly this Krishna consciousness movement is trying to bring forth again the dormant Krishna consciousness in every living entity. We are just trying to revive people's original Krishna consciousness. We are trying to awaken human society to come to the Krishna consciousness movement and live this life successfully. That is the Krishna consciousness movement.